Sydney, Australia: Unveiled today by the Lord Mayor of Sydney Clover Moore, a new artwork located in Wemyss Lane in Surry Hills by Australian artist Agatha Gothe-Snape now forms part of City of Sydney’s growing City Art Collection. Lord Mayor Clover Moore said: Agatha Gothe-Snape’s intriguing work draws attention to a site that might not otherwise attract notice, connecting with the residents of Sydney and revealing their stories. The success of events like the Biennale shows there is enthusiastic public support for contemporary art in Sydney – people want to be inspired, challenged and delighted by art, and Agatha’s project succeeds on all fronts. As a city government, we’re committed to encouraging Sydney’s appetite for groundbreaking art and inspiring public places. Sydney-based artist Gothe-Snape (b.1980) is highly regarded for her conceptual practice, and has exhibited her work extensively, both nationally and internationally. Gothe-Snape describes this new artwork as a ‘choreography for the city’. The Biennale of Sydney and City of Sydney last year awarded her the second Biennale Legacy Artwork Project, and the project was developed during 2016 as part of the 20th Biennale of Sydney: The future is already here – it’s just not evenly distributed, curated by Stephanie Rosenthal. 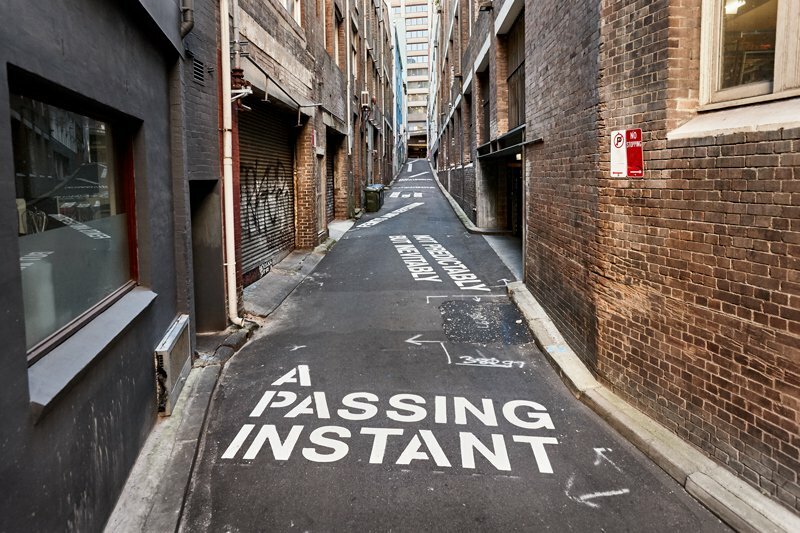 The extended period of research, which included performances, walks and conversations informed the development of the 14 phrases that now appear in perpetuity in Wemyss Lane. Gothe-Snape noted that: My work Here, an Echo responds to the ambiences of Sydney. It was thrilling to spend time in the streets, laneways and public spaces of the city, listening to its utterances. My aim was to produce a work that was generated by the city itself, and available to all users – residents, workers, tourists and artists – as a trace that relates to the past, present and future of Sydney. I am delighted that the work has materialised into a permanent work in Wemyss Lane, Surry Hills and now available for public viewing. Jo-Anne Birnie-Danzker, Director and CEO of the Biennale of Sydney comments: We are delighted to once again partner with the City of Sydney and unveil this second Biennale Legacy Artwork Project. Our collaboration means key works commissioned for Sydney by significant contemporary artists remain accessible to its citizens and visitors beyond each biennial exhibition. MEDIA IMAGES: Please visit https://www.dropbox.com/sh/piplduch2rko33e/AADjKccm7m9kD70Xmu3dfWNUa?dl=0 to access press images with captions.